Fire erupted after a car slammed into a historic building in Hatboro, Montgomery County, on Saturday evening, 12/8. It happened around 3:50 p.m. at the Pennypack Mill, formerly the Old Mill Inn, on Horsham Road at York Road. A mother was teaching her son to drive when he lost control of the car and slammed into the side of the building. The car became engulfed in flames and also set the building on fire. Fire crews quickly put out the 2-alarm blaze. The mother and son escaped without injuries. The building goes back almost 300 years. The longtime restaurant was recently converted into an event space. In fact, a 50th birthday party was scheduled for Saturday night, but had to be moved to a relative's home. Owner Lynda Clauser said there seems to be little damage considering the crash and flames. Only the bathroom downstairs and part of the upstairs was damaged. 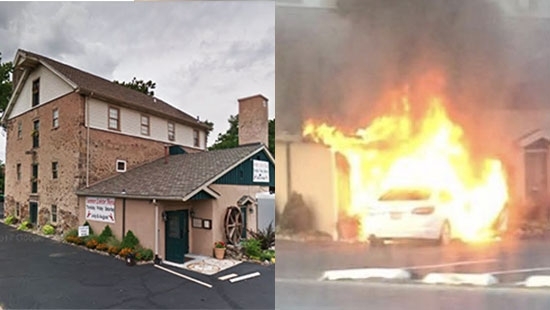 The Delaware Office of the State Fire Marshal ruled a motel fire in Newark, Delaware an arson. 44-year-old Larry E. O'Neal of Wilmington has been arrested and charged with arson and reckless endangering. Fire crews responded shortly after 10:30 p.m. Friday, 12/7, to the Super 8 Motel at 268 East Main Street. Flames were shooting from a second floor motel room. Investigators determined the O'Neal intentionally set some items on fire inside the room. Damage was estimated at $100,000. One man was taken to the hospital with non life-threatening injuries. Philadelphia Police are looking for a man wanted for stealing 18 propane tanks from two locations in Northeast Philadelphia. On Friday, 12/7, at approximately 9:30 p.m., the suspect stole 15 propane tanks from the Sunoco on the 1100 block of Cottman Avenue near Lawndale Ave. He was caught on surveillance camera. The man used bolt cutters to open up the locker outside the station and loaded the tanks into the back of his dark-colored Ford F-150 pickup. The same suspect then headed to the Rite Aid on the 7400 block of Oxford Avenue and stole 3 more tanks. He fled in an unknown direction. The suspect is described as a tall man of unknown race. He was wearing a white or tan hoodie and black pants. If you have any information, contact Philadelphia Police.